It is that time of the month when we get to know the amount of reach that various Android OS version have reached the end user and which one is about to die. And with this there is good news coming in which suggests that the Android 4.0 Ice Cream Sandwich OS has hit the double digit mark and now runs on about 10.9% of all Android devices out there. Now this is a nice jump from the previous 7.1% which was observed last month, thanks to almost all the OEMs who are finally rolling out the upgrade to older devices which were eligible for the new ICS taste. But the Android 2.3 Gingerbread OS sill rules the world of Android with over 64% of devices still running on it. But the share of Gingerbread has seen a decline of 1% compared to the previous month which is indeed a good sign as ICS is seeing more arrival. 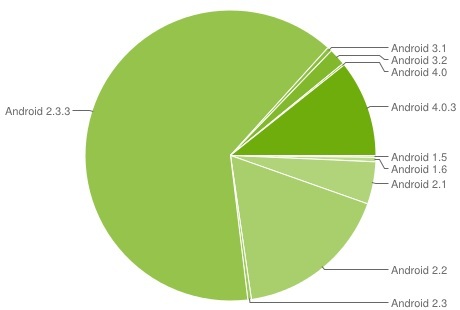 It is also to be noted that it is only Android 4.0 ICS which has gained the market percentage. All the other OSes have seen declines in their share. Android 2.2 Froyo has fallen to 17.3% than the earlier 19% and Android 3.x saw a decline from 2.7% to 2.4%. We expect the Android 4.0 to gain more share by the next month which would be a good sign for the Android ecosystem and also the millions of users out there. Also please note that Android 4.1 Jelly Bean is not a part of this share because the OS is not yet out commercially on any device.